Rochelle Intermodal | N Scale layout » Blog Archive » It’s done! The railroad room / garage / man-cave is finally completed! Last weekend I finished the wall painting and completed laying the wooden floor. 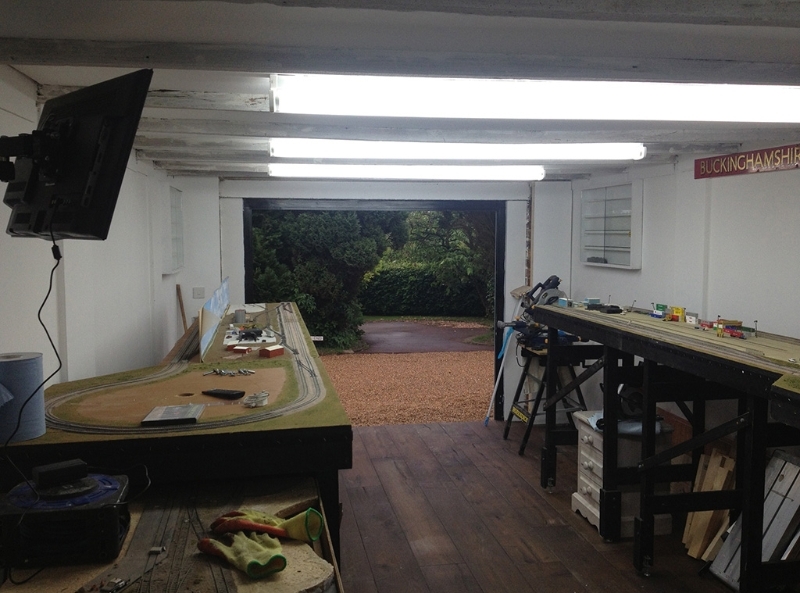 Tonight I put the layout up to work out final positions – as you will see in the photos below the layout has been split into two (the garage is not long enough for the full layout length). My next project is working out what I am going to put between the two sections. At present the plan is for two corner boards plus 2 straight boards – I’m not sure what will be on the two boards at the moment, but I do need a yard, so I will see if I can fit a small one in there, otherwise another plan is to…wait for it…add another level! I won’t use a helix, rather a gentle incline, just enough to put a hidden staging yard under one of the sections. But that is for the future – for now I will work on planning the under-layout storage and finishing off the wall decorations (posters & railroad memorabilia). In the photos below you will notice two display cabinets, which will be used for my HO locos & rolling stock and the most important item…a TV with built-in DVD player! 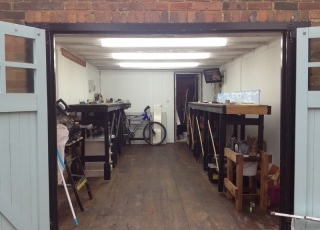 Oh, and a bar fridge in the workshop area at the back of the garage – all the essentials!! Over the next few days I plan to hook up the layout electrics to see if everything is still working, then I will start the planning of the new boards.